George Geekish is a professional’s professional – always thinking about how to keep production value up while keeping in budget and on time. While it may appear that just splashing a bucket full of skintoned paint on Lee was the easiest and cheapest solution to their problem, closer observation will reveal that it is, actually, only the *second* easiest and cheapest. The *absolutely* easiest and cheapest solution would have been to just change the script to explain Snuka’s blue skin as some side-effect of the invisibilty serum. And Lee had really tried everything to get rid of the blue hue – he spent a lot of time in the shower, rubbing himself. A lot *more* time, I mean, than is normal even for a kid his age. Sudden appearances and disappearances are really one of the oldest cinematic tricks, already widely employed in the late 19th century. Gradual appearances and disappearances are trickier, but even those have been around for more than 70 years. I think it can still be pretty effective in a movie, however, if it’s played right. Lee just can’t catch a break … the only positive thing about this whole ordeal is that, if acupuncture really works, he should now never get any kind of illness ever again. And he now completely fulfills another stereotypes about Asians: he has absolutely no perspiration anymore. *And* it should be a lot more difficult for things to get under his skin. *And*, for a stuntman as accident-prone as Lee, being covered in two layers of fire-retardant paint might come in handy at times. Quite a few advantages to the situation, actually. 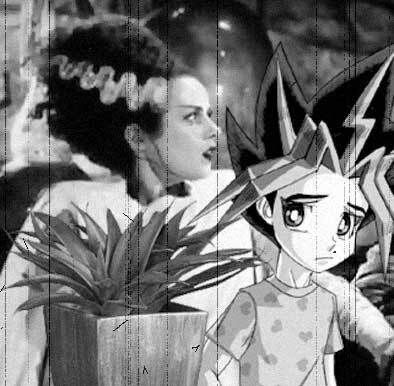 There’s absolutely no doubt anymore: Yu-gi-oh’s parents were the Bride of Frankenstein and a potted agave. And it shouldn’t be much of a surprise, anyway: Firstly, Dr. Pretorius had been known to experiment with human/plant hybrids earlier (seaweed), so it’s just the logical next step. And secondly…well, there just *is* no other way to explain the hair. Apparently, Pretorius even managed to instill his peculiar sense of fashion into his dorky creature, which also explains a lot. And the little homunculus even went on to bring about what his creator had always dreamed of … *raises graduated beaker of gin* ‘To a new age of gods and monsters’. Well, more on Monday. Please vote.